Up early to listen to Chris Paton talking about Scottish Civil Registration. It doesn’t seem to matter that I have no Irish interests and very little connection to Scotland, I still enjoy his sessions. We learn that Frank, our lost party-member, has been located and will rejoin us a Copenhagen. In between preparing for my own session, I listen to Shauna Hicks taking about ‘Family History on the Cheap’. No sooner had Shauna started than the Captain’s voice comes over the tannoy, at full volume, giving details of where we are, ship’s speed and weather conditions. This goes on for a considerable time. Just as it seems that Shauna can continue, the events’ manager starts encouraging us to attend demonstrations of towel folding by the housekeeping team. 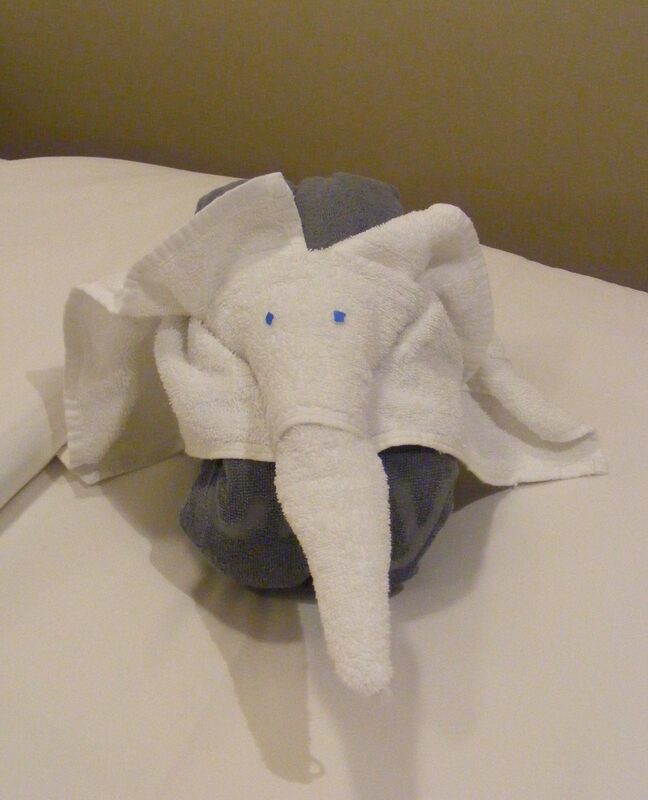 This towel folding, in the shapes of various animals, is quite fun but we don’t really want to listen to all this. Every onboard event of the day is described in minute detail. Even then we are not free to continue our session as this all has to be described again in Spanish! Barb Toohey gives an interesting presentation on producing family history charts. I am convinced that this must be much harder than she is making it seem but she has done some fascinating work. Afternoon sessions include Chris Paton again, on Scottish Land Records this time – note to self – but look at the Statistical Accounts. This is followed by another research help zone and then Cyndi’s interesting presentation about timelines. I leave this rapidly to descend ten decks for my own presentation on one place studies. A surprisingly large audience considering that it is 5pm and there is another session on at the same time. I try to ignore the fact that I appear to be losing my voice. Our conference day concluded after dinner with Helen talking about interviewing granny. Apparently, just after midnight, we passed under ‘The Bridge’, of ‘Nordic Noir’ fame, with only 5 metres’ clearance. It seems that this was accomplished without incident as Deck 14 is still visible. Bizarrely, the first four km of the bridge are in fact a tunnel. Today we are group ‘Purple 9’, with Ivi, a hilarious older lady, as our guide and Freddy as our driver. Due to a cancellation, this is a replacement for our original choice of excursion and it seems that we have chosen well. We pass a new version of The Little Mermaid, nicknamed ‘Dolly Parton’. Ivi explains that this mermaid has had the benefit of silicon implants. We travel across the main island of Seeland. 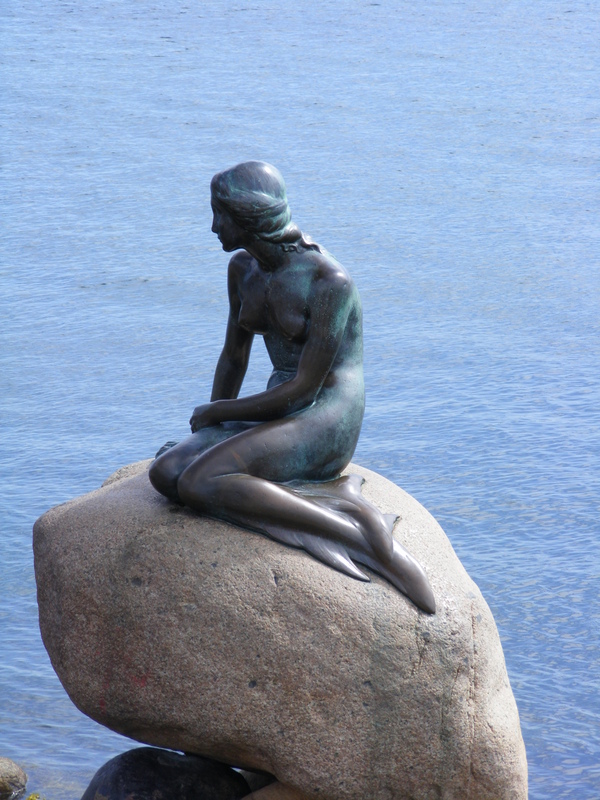 There is a photo opportunity at the real Little Mermaid, sculpted in bronze and granite by Edvard Eriksen and donated to Copenhagen by brewer Carl Jaconsen in 1913 as a representation of the character from Hans Christian Andersen’s fairy tale of the same name. Bishop Absolon founded Copenhagen in 1167 and built the first fortification there. Many older buildings on some of the sandy islands stand on a bed of oak foundations. We pass the Citadel, which was built By Christian IV in the 1600s in the shape of five pointed star. In 1658, when the Swedes attacked, they were unable to get across the ice-filled ramparts. Christian had twenty three children, some of whom were illegitimate but all were acknowledged. We also see his summer house and garden. Although the Second World War had less impact on Denmark than other countries, there is an ‘angel monument’ to ships lost by mines in the Baltic. 7000 Jews were evacuated to Sweden to escape being rounded up by the Nazis occupiers; thus almost all escaped. We do see the Gestapo HQ, that was bombed by the RAF. We learn that the Danish fleet was the 2nd largest in Europe after the UK, although I am not sure at what date this applied. Northgate Station, is of interest for the plants growing on the roofs of all the shelters. Denmark’s terrain means that it is another country where cycling is popular but there was not a safety helmet in sight. Again we have tried to pick a tour that takes us out of the city centre. And we have coffee and a Danish pastry in Dragor. 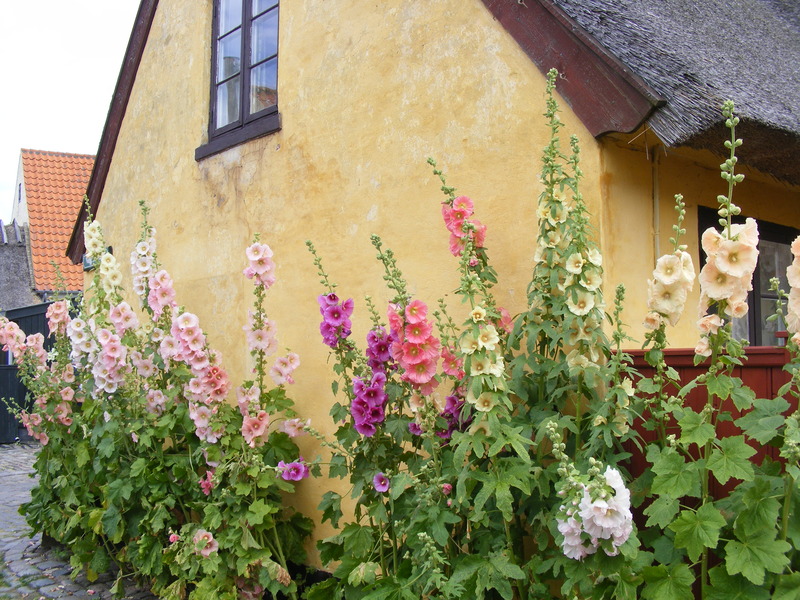 This is a picturesque C13th fishing village, with a preponderance of hollyhocks. The fishing was primarily for herring and this began to decline in the C15th. In 1517, twelve Dutch farmers were imported to use the land and the Danish families were moved out. 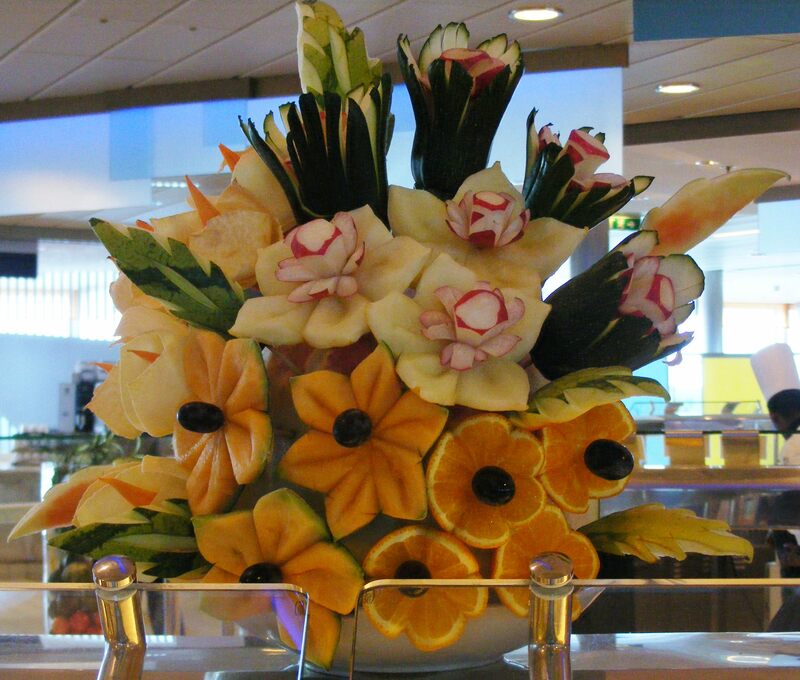 These incomers specialised in vegetables. The hotel at Dragor has four toilets, so 100% improvement on previous trips and we are the only coach in sight; other destinations have seen our coach as one of forty. Dragor is the site of a former fortress. Legend states that St. Martin was reluctant to be a bishop, so he hid with the geese but their noise gave him away so he was forced to become a bishop. He therefore ordered the slaughter of the geese, which us a traditional dish on St. Martin’s Day and on Christmas Eve. Dragor means ‘a place where geese are reared‘. Barley and strawberries are grown, the latter are late this year due to the cold spring. Here Lent is celebrated with tilting the quintan. Heading back to the city, we drive under runway of Copenhagen airport, Scandinavia’s busiest, just as plane takes off. The proximity of the airport to the city (12km) means that tall buildings are discouraged in the city; few are more than six stories high. We pass a Christmas Tree farm and visit the square, with its four identical Royal places, built in 1750 and see the changing of the guard by the Royal Lifeguard. Although there are still many tourists, it is a little less than overwhelming than at some of our previous destinations. We do not have time to visit Tivoli Gardens, which were created in 1843 and resemble Battersea Funfair. The Gefion Fountain is impressive. This is based on the C9th legend of the Norse Goddess Gefjun or Gefion. The Swedish king Gylfi said that Gefjun could have as much land as she could plough in a night. Her four sons were turned into bulls thus allowing her to plough the whole of what is now Seeland. We return to the ship for a very good talk about occupational and guild records from Paul Milner. 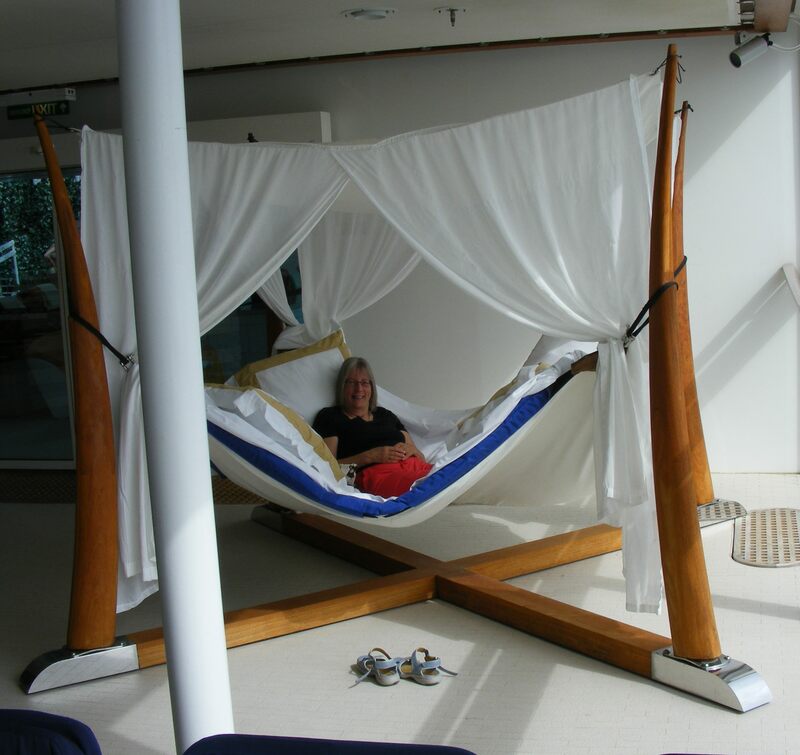 What a wonderful trip but feel you may need a holiday to get over it!